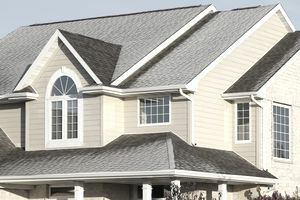 Insulated vinyl siding is standard vinyl siding with a backing of solid rigid-foam insulation. By filling the voids behind the siding’s stepped profile, the insulation makes the complete material stiffer and more resistant to warping and movement than conventional vinyl siding. The insulation also adds some R-value, or insulating quality, to the siding. These benefits make insulated vinyl seem like an easy, worthwhile upgrade to conventional vinyl, but there’s a significant cost increase with insulated vinyl, and many builders and homeowners question whether the price premium is worth it. Insulated vinyl siding has an outer skin made of polyvinyl chloride, or PVC, just like standard vinyl siding. To the backside of this skin, a layer of form-fitted expanded polystyrene (EPS) is glued for a permanent connection. While the front of the insulation is profiled to match the stepped vinyl siding, the back of the insulation is flat so the siding installs flush against the home’s exterior wall sheathing. The insulation itself can be up to 1 1/4 inches in thickness at its thickest point, but due to the stepped profile, much of the insulation is thinner. The bottom edge of the insulation is shaped to receive the top edge of the siding course below so the pieces overlap. Insulated vinyl siding is installed with nails, as with standard vinyl. The primary benefit of insulated vinyl is not what most people expect. That is, it’s not that the insulation makes a home much more energy-efficient. The insulation does add some R-value to a wall but only a modest amount, typically estimated at R-2 to R-2.7. Manufacturers often claim a significant reduction in thermal bridging when homes have insulated vinyl siding. Thermal bridging allows heat to escape from a home by conducting through non-insulation materials like wall studs and plywood sheathing. However, there is little evidence that insulated vinyl significantly reduces thermal bridging in homes with standard wall insulation. The other benefits of insulated vinyl are less subject to debate. Namely, that the insulation firms up the siding so it looks and feels more solid. Uninsulated vinyl is sometimes called “hollow vinyl,” owing to the hollow spaces behind the vinyl skin. The material is quite flexible and easily conforms to any waviness in a wall plane. Standard vinyl also pushes in easily when pressed on, and the seams between panels can even rattle in the wind. All of these conditions are greatly reduced or eliminated with insulated vinyl. The insulation helps bridge over contours in the wall structure, and it gives the siding—and corner trim and other edging materials—a solidity that standard vinyl lacks. The main drawback of insulated vinyl is its relatively high cost. Adding insulation to the back of vinyl siding can raise the cost by 20 to 50 percent. Installing insulated vinyl is similar to a standard vinyl installation, so there’s no reason why labor costs should be significantly higher with insulated vinyl. However, it’s important to use an installer who is experienced with insulated siding. The benefits of insulated vinyl—including the added thermal performance and the improved look and feel—are based on precise installation to eliminate gaps in the insulation backing, which can detract from the insulation value and the overall appearance of the finished product.